Buttery, flaky, warm, if you haven’t guessed by now I’m talking about biscuits! I love all things bread, but biscuits have a special place in my heart. Whenever I go to a restaurant, if they have biscuits on their menu ten times out of ten I’m getting them. I don’t think I’ve ever met anyone who doesn’t like biscuits you can do so much with them. You can put jam, jelly, butter or honey on them or eat them just as is. You can make sandwiches and of course you can’t forget biscuits and gravy. I wanted to challenge myself this month especially in making things that I love eating but had no idea how to make. I did a lot of research on what makes a biscuit flaky, soft and fluffy. The secret is cold ingredients; from the flour, baking powder, buttermilk to the butter. Butter is about 16-17 percent water, when the little pieces of butter that are in the dough bake in the oven, they release steam in those pockets and it creates the flaky layers that we love to see in biscuits and any pastry. I would recommend placing your stick of butter in the freezer for 30 mins before beginning to bake. I put the flour and baking powder in the freezer as well. I made a regular batch of buttermilk biscuits, one plain and the other batch I added chives and thyme. I also made a vegan batch of biscuits as well. Both batches were fluffy, flaky and just so darn good. I almost ate them all myself! For the vegan biscuits, I substituted regular butter for margarine or vegan butter and I used almond milk in the place of the buttermilk. Honestly, if I didn’t say they were vegan you could not tell the difference. Another tip for making biscuits is don’t over work the dough, you will have to knead the dough but don’t knead it too much. As you work the dough, you are creating gluten and the more gluten there is, the more likely that your biscuits won’t rise as they should. If the biscuits don’t rise you will not get those flaky layers everyone loves. And trust me, no one wants that. The last tip I found to be helpful was to use a cookie cutter or biscuit cutter to cut out my biscuits. This will not only help your biscuit to maintain their shape but also in the creation of well defined layers. When using a cookie/biscuit cutter, do not twist the cutter once you have placed in the dough. Doing so will prevent the biscuits to rise properly. If you don’t have a cutter, you can use a knife to create square biscuits. I baked my biscuits in a cast iron pan; if you don’t have a cast iron pan you can use a regular baking sheet, but be sure to line the sheet with some parchment paper. With the help of my boyfriend we made some buttermilk brined fried chicken sandwiches with the biscuits that had the chives and thyme, made a simple slaw with red cabbage and carrots, slapped some pickles on them and enjoyed. For breakfast I had them with some strawberry jam and made a simple honey butter to accompany them. I hope you guys have fun making these, Be sure to let me know how they turn out, leave a comment below, tag me in your pictures so I can see. Bon appétit mes amis! 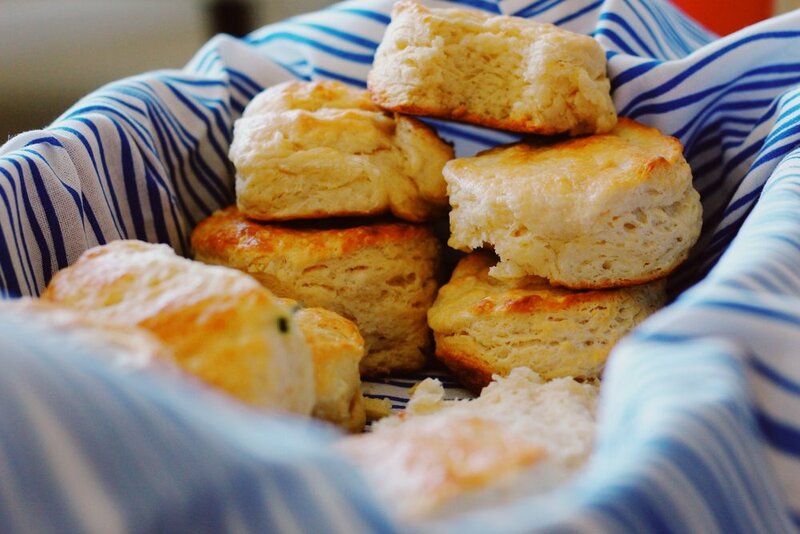 This recipe will give you the best biscuits. Soft, warm, flaky biscuits will all of the layers a biscuit should have. Very simple and you can enjoy in less than hour. Pre heat oven to 450 °F; In a food processor, mix flour, baking powder, butter and salt and pulse until your butter is pea sized. If using a bowl, you can grate your butter into the flour mixture. Create a well in the flour mixture then pour in the cold buttermilk and mix together gently until the dough starts to come together (be sure not to over mix) Once it has come together, on a floured surface take the contents of the bowl and work it together, getting all the crumbs. Put the dough into a rectangle and fold it in thirds, turn it over and do this three more times. Remember to be gentle. Remove the biscuits from the oven and brush the tops of the biscuits with melted butter if desired, or leave as is. Allow them to cool and then serve with jam, honey and enjoy! Substitute the butter and buttermilk steps with vegan butter and almond milk or your choice of milk. Then continue following the steps of the recipe as is.